Posted on September 19, 2018 by Mia T.
Have you ever imagined the fairy tales you read as a child having different endings, different villains, different heroes? Have you ever wondered how Ursula became so evil, why kings like to assign three impossible tasks to win their daughters’ hand in marriage, or if the Minotaur was really the monster he was accused of being? Though inspired by fairy tales, mythology, and classic stories, the six stories in Leigh Bardugo’s The Language of Thorns go beyond the basic tales. They are all short stories written in the style of a fairy tale. Although these stories are set in the same world as Leigh Bardugo’s other novels, they made sense even though I hadn’t read any of her other work (now, after reading The Language of Thorns, I look forward to reading Leigh Bardugo’s other books). Leigh Bardugo creates such a detailed, beautiful, and sometimes dangerous world, and in it she expands upon and adds her own ideas to well-known tales. These stories are elegant and some are a bit creepy (if I had known this before reading, I may not have picked up the book, but now I am glad I did–I really enjoyed reading this book despite the darker parts), and the excitement of the stories combined with the amazing writing makes the book so hard to put down. I loved how each of the stories had a twist at the end—maybe the villain in a story was not the same character in the original fairy tale (or someone you hadn’t even considered) or the real source of the conflict was an immense surprise. These stories did not always end with a happily ever after, and although I do like happy endings, this was a refresher from the widely expected endings of fairy tales. It made the stories a bit more exciting and unpredictable. Some of the parts I loved most about this book were the illustrations and borders created by Sara Kipin. At the start of each story there are one or two small illustrations in one corner or part of the page, and as the story continues, new images that connect to the story are added on to the illustrations. At the end of each story you can almost see the tale in the pictures that make up the border. There is also one big picture at the end of each story that shows a scene in the tale. The pictures are beautiful, so thought out, and I really liked seeing the story show through them. If you are a fan of fantasy, fairy tales, or even just someone looking for fascinating tales to read, I would definitely recommend this book. Not only is the writing magical and detailed, but the world, characters, and illustrations are so well-developed and seem to fit together wonderfully. However, be warned: in this collection of tales the faint may not always be as they seem, and the real villains may have a story of their own. 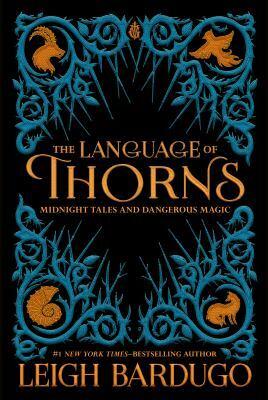 The Language of Thorns by Leigh Bardugo is available for checkout from the Mission Viejo Library. This entry was posted in Book Reviews and tagged fairy tales, fantasy, mythology, revenge, sacrifice, short stories by Mia T.. Bookmark the permalink. Nice review! I haven’t read this book yet but I look forward to reading it!